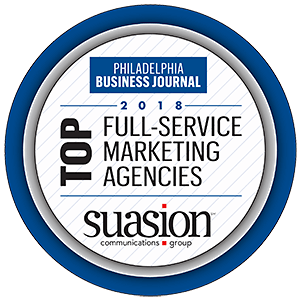 Suasion Communications Group has been recognized by the Philadelphia Business Journal as a 2018 top Branding, Marketing, and Media Services Agency. Suasion is the only New Jersey-based agency to be included in this year’s top Full-Service Marketing Agency category. Suasion’s award-winning services include branding, public relations, digital marketing, creative and web design. The Philadelphia Business Journal only recognizes businesses with a clear commitment to excellence on behalf of their clients as award-winning agencies. Suasion, a certified Women Business Enterprise (WBE), provides customized branding, digital marketing and public relations campaigns for tourism destinations, municipalities, healthcare professionals and nonprofit organizations in the South Jersey and Philadelphia region. In 2017, Suasion was recognized with an Event Marketing award from Ragan’s 2016 PR Daily Awards. The award acknowledges Suasion’s efforts in public relations with client partner, the Greater Wildwoods Tourism Improvement and Development Authority (GWTIDA). In addition to this PR Daily Award, Suasion is also a recipient of a 2017 New Jersey Tourism Excellence Award, marking Suasion’s third consecutive year winning an award from the New Jersey Tourism Industry Association (NJTIA). Suasion is also a winner of the 2016, 2015, 2014, 2011, 2010, and 2009 New Jersey Tourism Excellence Awards; 2016, 2015, 2011 Hospitality Sales and Marketing Association International (HSMAI) Silver Adrian Award and a 2009 HSMAI Bronze Adrian Award; and two 2013 Ragan’s PR Daily Awards (Best Branding Agency and Best Green Initiative). In 2015, the Philadelphia Business Journal selected Susan as an Entrepreneur of the Year. Earlier this year, Susan was also selected for the Goldman Sachs 10,000 Small Business 2017 Philadelphia Spring Cohort. This highly competitive scholarship program for established entrepreneurs assists participants in taking their businesses to the next level. Discover what Suasion can do to help your business succeed by calling 609-653-0400 x103.